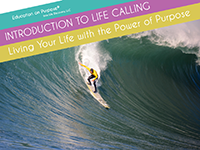 Education on Purpose® offers two different curricula related to life purpose. The first is a curriclum designed for Christian schools and organizations. The second is a curriculum for institutions and organizations that do not have a strong religious base. This page will describe in greater detail the life calling curriculum created by Education on Purpose® for Christian schools and organizations. Click on the link below to learn about this curriculum. This page will describe in greater detail the life purpose curriculum created by Education on Purpose® for schools and organizations that are not religious based.